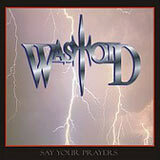 Here is a self financed album by a band that makes me wonder if the NWOBHM era never died. Memories of Raven, Samson, Savage, and I guess about 20 other bands from that era twenty years ago come to mind while listening to this album. This is a raw sounding, but catchy album dominated by duel guitar harmonies, meaty riffs, and flaring solos. As I touched upon, we're talking about pretty straight forward stuff here: of the eight total tracks, I see four of them have the word "rock" in the title. Okay, Wastoid scores no points for originality: they're cheesy in every sense of the word. However, the songs actually aren't as bad as you might guess by solely reading the song titles. With the exception of the lame keyboard parts in Let It Rock, the eight tracks on this album are enough to please any NWOBHM fan. You'll hear a steady dose of energetic riffs and dual guitar harmonies which steal the spotlight for me. Both lead guitarists are not shy at all, and they add a ton of life to these songs. The bassist stays right there with them, providing a solid backdrop for the sound. The lead vocalist fits the style of music very well, reminding me of Raven's John Gallagher quite a lot, but his delivery is somewhat thin at times. Nonetheless, Wastoid have come up with eight powerful and catchy metal anthems that surely would have drawn some attention twenty years ago. If this band gets label support and a recording budget, I think they will do quite well. However, this style has been covered by so many bands over the past 20+ years, so they will need to work hard to get noticed. From a technical standpoint, there is certainly talent in this band. If the lead singer can touch up his delivery and if the band can perhaps come up with some more interesting lyrics, it can only help their cause. In the end I am happy to see bands like Wastoid keeping this style of music alive.